CHARLESTON, SC (WCSC) - Authorities are attempting to identify a woman who they say attempted to abduct an 8-year-old child at a Publix parking lot. On Thursday, investigators with the Goose Creek Police Department released information and pictures of the suspect sought in the incident at the store location on 206 St. James Ave.
Police say around 8 p.m. on Monday the woman approached a customer and requested a store receipt. “The subject then later approached the same customer a few moments later in the parking lot and asked to help load groceries,” GCPD officials said. According to a police report, once the help was declined, the customer noticed that the woman was walking away, and had the customer’s child behind her. Authorities say the customer was able to call her child back to her, and the unknown female walked off in the direction of Central Avenue. GCPD officials say the photographs they released contain images of the unknown woman inside the Publix. If you have any information as to the identity of this woman, you are urged to call the Goose Creek Police Department at (843) 863-5200, Crime Stoppers (843) 554-1111, or Lieutenant Ramirez at (843) 863-5200 ext. 2410. A police report of the incident states an officer responded to the Publix Monday night for a suspicious activity. The officer said he spoke with the victim who said an unknown woman wearing athletic wear and a salt and pepper afro approached her, and while she was finishing bagging her items, asked for a receipt. The victim said she provided the receipt to the woman who said she needed the receipt in order to receive a discount while purchasing a gift card. The victim told officers that as she was putting her groceries in the trunk of her car, the woman approached her again and asked her if she needed help putting her grocers in her vehicle, at which time the victim declined. Shortly after, the victim said she turned around to look for her son who was “two cars” away with the woman. The victim said her son was being escorted away by the woman. “[The victim} said the lady was walking backwards facing her and it appeared that she was trying to take her child,” a police report states. According to police, her son asked her mother,"Am I in trouble?" and told her the unknown lady was pushing him away. The victim said she yelled at her son to come back and the unknown woman departed the scene. The investigating officer reviewed camera footage inside Publix and reported seeing the subject identified to be in her fifties, wearing a blue tank top with black leggings. GCPD officials say the footage shows the interaction between the victim and the woman, with the victim leaving the store later and the woman leaving a few seconds later. 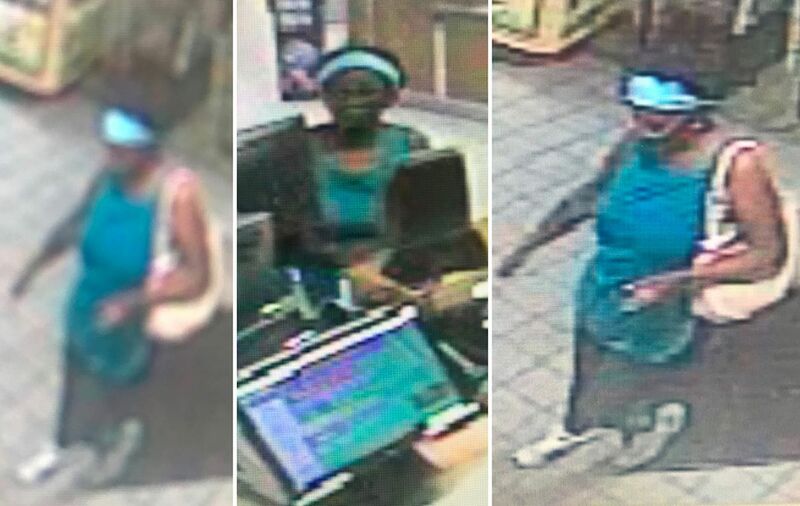 According to police, the unknown woman can be seen returning to the store, making her way back to the customer service desk where she appeared to purchase a lottery ticket.